It is no secret that a woman's chances of conception decrease by age. Although the relationship between fertility and age is well known to women trying to conceive, many are searching for means to estimate the probability of getting pregnant at various ages. 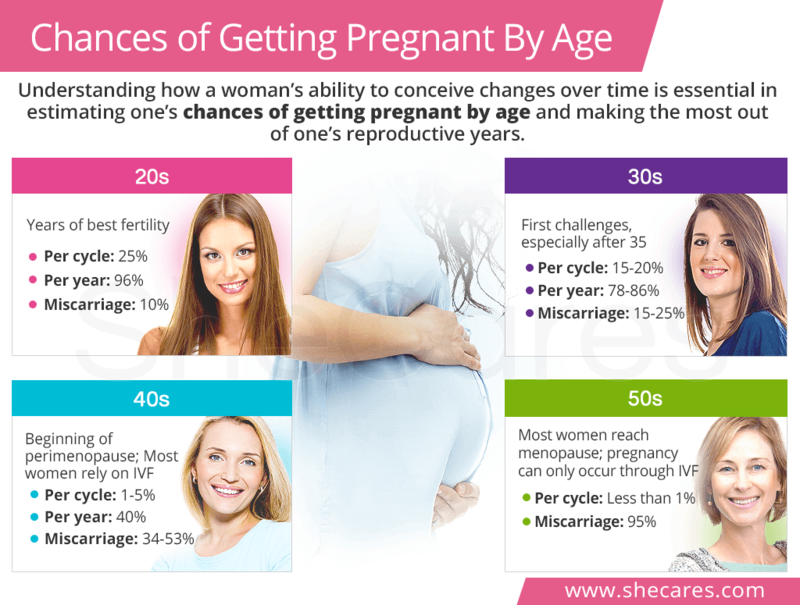 Continue reading to learn everything about how your chances of getting pregnant by age change from your 20s to 50s so that you can make the best reproductive choices without compromising your chances for motherhood. A woman's 20s are her most fertile years. The ovarian reserve, which is the lifetime supply of eggs that can be used for ovulation, is abundant, and there are barely any chromosomal abnormalities that might cause fertility issues. As such, the risk of miscarriages is the lowest, about 10%. Consequently, 20-year-old women have 25% chances of getting pregnant in any given menstrual cycle, which are the highest among all age groups. Within a year of active trying, about 96% women in early 20s and 86% of those in their mid-20s will successfully conceive. Although women's odds of pregnancy are projected to be high throughout their early 30s, the first fertility limitations tend to appear after the age of 35. Chances of getting pregnant at 30 are still good, about 20% per cycle. Most couples (86%) achieve pregnancy within 12 months of trying. Miscarriage rates are slightly higher among women in this age range, but low enough to enable most conception efforts. In case of difficulties, women younger than 35 are encouraged to keep trying to conceive for a year before seeking help. Fertility after 35 takes on a steeper decline as women's ovaries still have a decent pool of eggs, but many of them have genetic abnormalities, resulting in higher rates of miscarriage, up to 25%. Pregnancy after 35 also comes with an increased risk of genetic conditions, such as Down syndrome, which now occurs in 1 in every 350 pregnancies as opposed to 1 in every 1,200 at the age of 25. Accordingly, getting pregnant after 35 naturally can be challenging for many women. In mid to late 30s, women are instructed to seek medical help after six months of unsuccessful trying to undergo infertility evaluations. However, despite these challenges, 78% of 35-year-old aspiring mothers conceive naturally with a 15% chance of succeeding every month. Many women in this age range who are not ready for pregnancy consider freezing eggs or embryos as a form of fertility preservation. Turning 40 presents a new set of reproductive difficulties for most women as studies have shown that fertility drops by 10% every two years after 40. Monthly chances of getting pregnant at 40 have now fallen to 5% because up to 80% of ovarian eggs are abnormal causing the rates of miscarriage to rise to 34%, among other pregnancy complications. Moreover, pregnancy after 40 is at a higher risk for genetic abnormalities with Down syndrome affecting 1 in 100 babies and increasing to 1 in every 30 by the age of 45. Another factor to take into account is the fact the male fertility also declines, though at much slower rates than in their female partners. Men might begin to have problems with the sperm production, transport, or function after 40, which can further lower a couple's chances of pregnancy at 40. However, despite reduced fertility at 40, women are still encouraged to attempt conceiving naturally with about 40% achieving pregnancy after a year. A woman's chances of pregnancy at 45 onwards are mainly affected by the onset of the menopausal transition, or perimenopause, which most commonly occurs in one's mid 40s. Characterized by irregular periods and ovulation problems, perimenopause puts a serious strain on a woman's ability to conceive naturally, lowering her chances to 1-3% per cycle. Because of high miscarriage rates, about 53%, and a much higher risk of genetic conditions (1 in every 49 babies have Down syndrome in mothers aged 49), most women in their mid to late 40s rely on assisted reproductive technologies (ARTs). In vitro fertilization (IVF) with egg or embryo donation from a younger donor is the most effective method (over 50% success rates). Natural pregnancy over 50 statistics are low, not more than 1% per cycle. Women at this age have very few eggs left in the ovaries; most do not ovulate, and great majority of the eggs have genetic abnormalities, preventing conception or causing miscarriage if conception is achieved. These poor chances of getting pregnant at 50 naturally are caused by the fact that women on average enter menopause at the age of 51, which is when they have gone without a period for 12 consecutive months. Once the ovaries stop releasing eggs, natural conception is impossible, forcing women to depend on ARTs. Studies have shown that the uterine functions of sustaining pregnancy do not decrease as rapidly as ovarian. So, pregnancy rates after IVF with donor eggs for 50-year-old women are relatively high, only slightly lower than those in mid 40s. Women who still menstruate can use fresh donor eggs, while postmenopausal women can only use frozen donor eggs for optimal results. When preparing for pregnancy, it is crucial to understand how a woman's ability to conceive changes over time and estimate one's chances of getting pregnant by age. Due to a natural decline in the supply of ovarian eggs, the younger a woman is, the more likely she is to conceive naturally. As such, women in their 20s are in the most fertile years with high number of eggs and 25% odds of getting pregnant per cycle. Once they turn 30, initial reproductive challenges appear, especially in mid30s. Consequently, the chances of getting pregnant at 35 and onward are about 15% in any given cycle. Getting pregnant at 40 naturally is possible, but difficult as most ovarian eggs hare abnormal and women enter perimenopause with a higher risk of miscarriage and lower odds of pregnancy (1-5%). At last, getting pregnant at 50 is virtually impossible as most women reach menopause in early 50s, ending their reproductive functions. For those in the 40s and 50s, IVF with younger donor's eggs is the best option to achieve pregnancy.